Bluegas is an ISO Certified company. 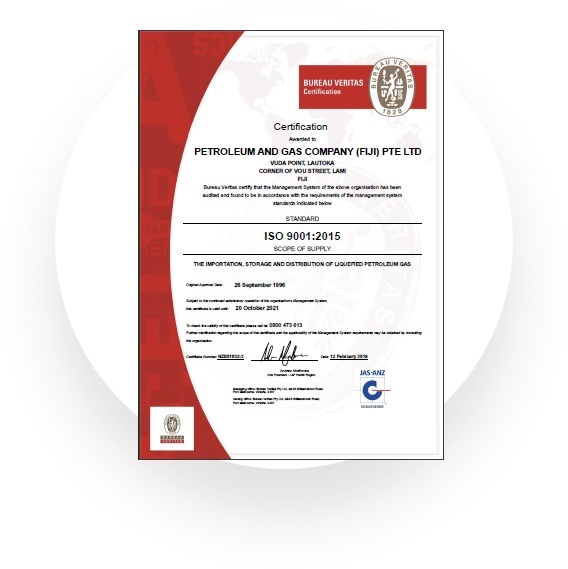 In 1996, Bluegas became the first and only gas company in Fiji to receive ISO_9002 Quality Assurance Certification. Furthermore, through its continuous improvements the company achieved ISO 9001- 2008 Quality Assurance in 2009. The certification status of the company is maintained after each round of external audit carried out by the certifying body – Bureau Veritas Quality International (BVQI). Bluegas is a bonafide member of Standards Australia. All our installations are strictly carried out as per Australia/New Zealand Standard namely AS/NZS1596, AS5601. Status on the revision of the standards is strictly monitored by us and revisions noted and updated. All our installations are carried out by our highly qualified and trained personnel. Furthermore, all our cylinders and bulk tanks including our storage tanks in terminal and transportable tankers are tested and certified by Ministry of Labour, Fiji. The company is also a member of Australian Gas Association, New Zealand Gas Association, Fiji USA Business Council, Fiji Australia Business Council, Fiji New Zealand Business Council and Allied Member of Pacific Power Association. Bluegas was incorporated on 16th January 1987 under the Companies Act, (Cap 247) of Fiji Islands and is 100% subsidiary of Hari Punja & Sons Limited (HPS). The registered office of the Company is located at Leonidas Street, P.O Box 977, Walu Bay, Suva, Fiji Islands. Bluegas is under the control of HPS Group and promoted as part of the Group’s business diversification strategy. The Company was formed in response to a growing demand for a gas company that could provide customers with a convenient, efficient and clean source of energy whether it be for domestic cooking, commercial uses, industrial purposes and auto-gas applications. Bluegas imports LP Gas, Industrial gas and spare parts (from New Zealand & Australia), stores and supplies the same for residential, commercial and industrial uses for both the domestic and export markets. The Company is also involved in supply, installation and servicing of LPG equipment’s and power generation. 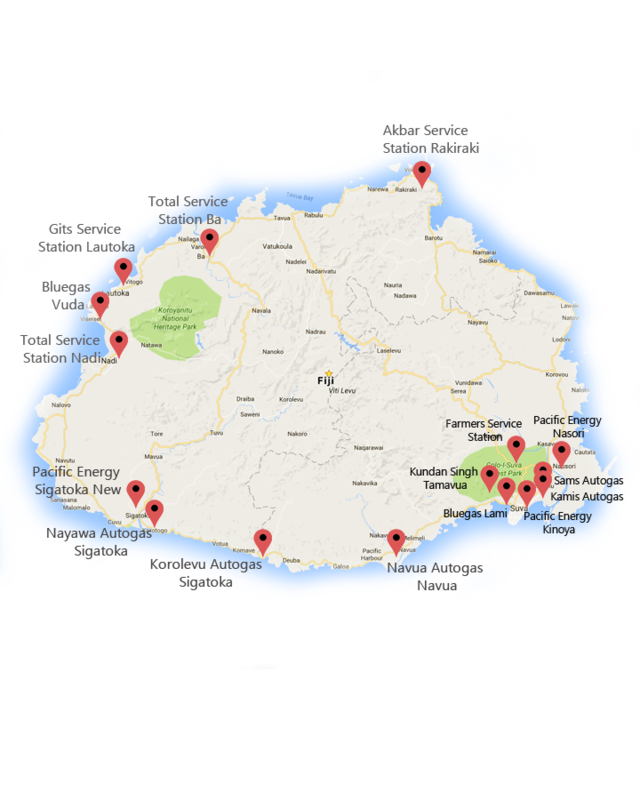 Bluegas is a professionally managed and a leading LPG supplier in Fiji with approximately 50% market share of Viti Levu. Also we are looking for option to move in to Vanua Levu very soon. Since its formation, Bluegas has achieved substantial growth despite strong competition and has now reached a long-term sustainable growth level that will enable it to scale up even faster. The company performs all commercial sales, operational and finance functions largely independently from other operations of Hari Punja & Sons Limited. Bluegas has its head office situated in Vuda and the company also operates a branch from Wailada, Lami, which look after domestic, commercial and industrial customers in central division. The company has its Autogas sites with three major fuel companies situated all over Viti Levu and planning to open five more sites very soon.